The ClareVision Plus (CVP) CVP-B4460-01 4-Channel NVR firmware v3.4.99 Build 180207 update changes the default authorization property from Digest to Digest/Basic. Once the firmware is updated, the NVR’s connection configuration is set to digest/basic by default. This setting allows ClareHome access to the NVR. Note: This default is only available after the updated. You can manually change the NVR setting. 4. Set both the RTSP and WEB Authentication dropdowns to digest/basic. 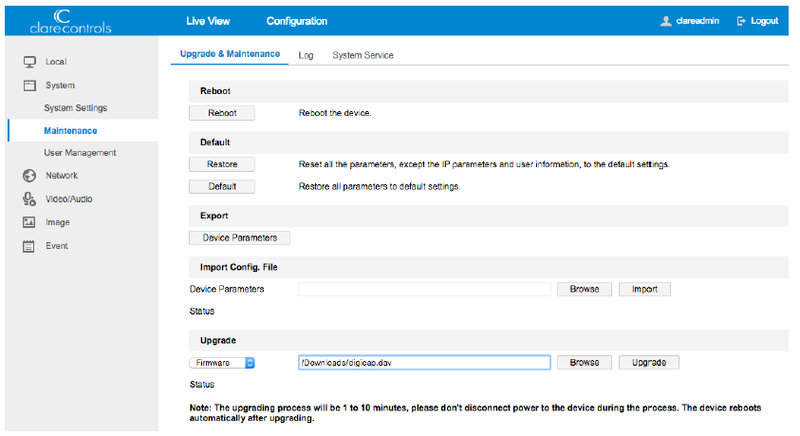 The new NVR firmware is found on the Clare Controls Knowledge Base. You must download and extract the firmware before you can continue. 1. Access the Clare Controls Knowledge Base ClareVision Plus Firmware page. 2. Scroll to find the correct firmware, and then click the firmware link. 5. Click Upgrade and confirm the upgrade. Note: The upgrade reboots the NVR.